These are General Electric made-in-Syracuse devices that we have sorted for creating noise in Zener mode. Test conditions + 15V through the device to a 1 Meg resistor to ground. Under test conditions, we guarantee 100 mv. p-p unamplified and no snap-crackle-pop. 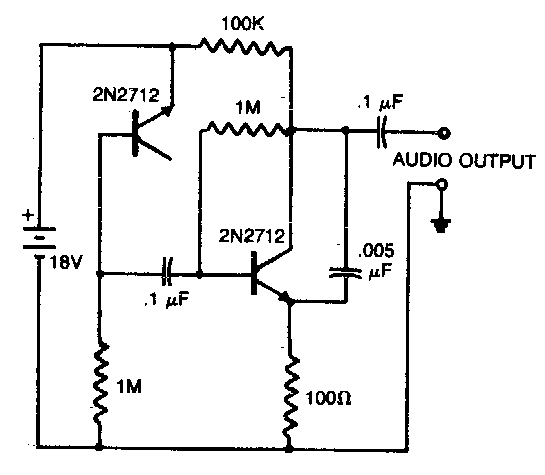 A typical basic circuit is here. The second transistor can be any common NPN device like a 2N5088, and it does not have to be sorted. Special Note: We can't discount for quantity because of the hand-sorting. If you use this kind of device for production, please buy bulk of SKU 2001N11 and sort your own. Those will be raw, unsorted devices. Click the button below to add the 2N2712 Work-alike Noisemakers to your wish list.